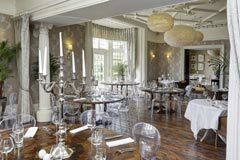 The big idea here was to create a truly contemporary Yorkshire Dales country house hotel. Stylish and sophisticated but not at all stuffy, offering the warmest of welcomes, a shelter from the inclement weather and just reward for your exertions out on the fells and moors. With wellies by the door, fires in the grate and even a dog curled up on the flagstone floor. and for parties and celebrations of all kinds too! 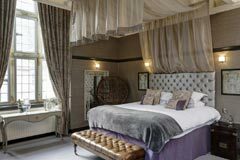 All 16 of our bedrooms have been completely refurbished, some rooms are big and some are small but all are equally fabulous. None more so than the magnificent Rafters Room, Falcon Manor's simply glorious Honeymoon Suite. Falcon Manor also makes the perfect wedding venue. Fully restored from top to bottom, it is glamorous and stylish with lots of contemporary twists. 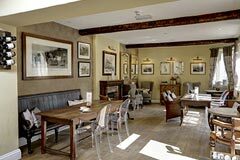 Plus there are photograph opportunities galore, with two bars, a snug, magnificent stairwell and a wonderful light-filled function room overlooking stunning terrace and gardens to the even more stunning Yorkshire Dales beyond. Then, when the day is done, you and your guests can retire to the equally magnificent individually designed bedrooms. 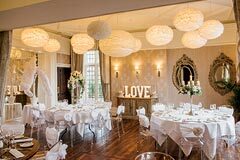 On the practical side we have a Civil Ceremony license for 80 if you would like to have your service at Falcon Manor, alternatively there are a number of churches in Settle and the surrounding villages. We are incredibly easy to find, have ample car parking and the famous Settle train station is on our doorstep with connecting services from Carlisle, Leeds and Skipton.